Fully funded You backers are AMAZING! We cant thank you enough for being with us and spreading the word about QooQi during this campaign. 2) Second stretch goal marked at $30k. We will throw in an additional QooQi at no extra charge with every pledge made by backers. If you pledged for 1 set of 2 we end up sending you 3 QooQi pieces for each pledge when we achieve the stretch goal. 3) Third stretch goal at $40k will unlock totally new product we are developing along with QooQi and it is called QooQi Mini. QooQi Minis are made of aluminum and with nano pad same as QooQi. They will be the smallest aluminum cable managers available. If final stretch goal is achieved you will get 1 extra QooQi and 2x QooQi Mini for each pledge made when we achieve the stretch goal. Images coming soon. New Pledge - We have also been asked by many backers to create a pledge with one silver/one black QooQi and we have decided to add that. Multiple units - We have also been asked about multiple units. We are here to help so if you are interested in multiple units just send us a message. We would like to use these remaining 2 weeks to achieve the stretch goals so lets go spread the word together about QooQi. Thank you! I too am not a fan of any of these colors. How about a natural or chrome? Thanks to everyone for chiming in so far. 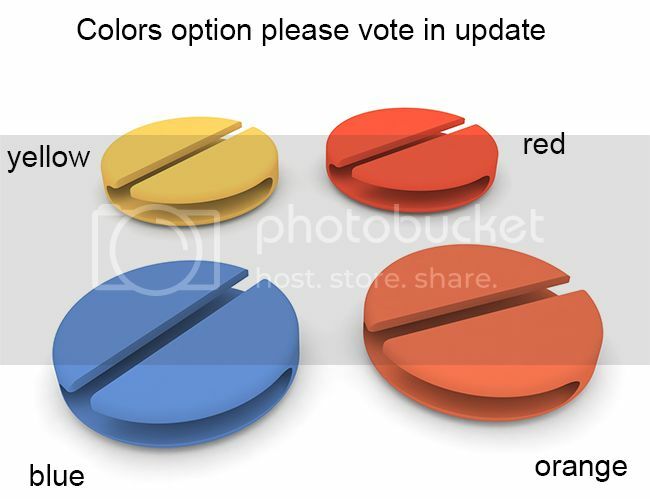 2 colors leading but there is time and we need to achieve the goal first :-) Lets keep spreading the word. Sorry but I don't any of those colors. I would have gone with white, brown, & beige along with the silver and black. Blends in with most furniture. Orange, terracotta, brick, etc. please! Voting in the comment section is a bad way to go, you may want to look into survey monkey for a more reliable and accurate voting method. Either way I'm hoping for stretch goal #2 for sure!